Hello and happy Monday, friends! 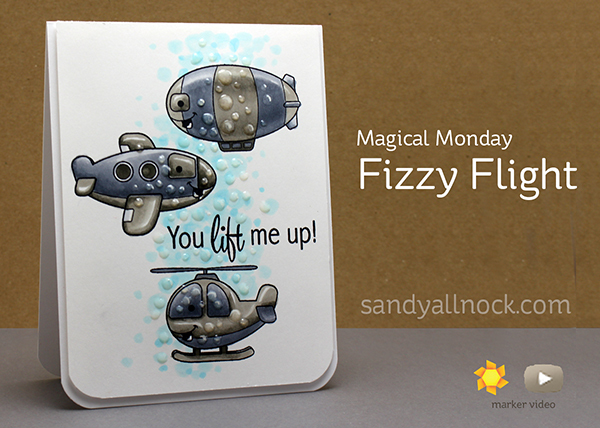 Today I’ve got a fun little bubbly card to share in traditional Magical Monday style….big thanks to Your Next Stamp for sending me these cute planes! I wasn’t sure what technique was going to happen with these cute little planes. I thought about rusty, or supershiny, or….or…or….and they became a study in cools and warms. That was all fine, but when I finished the planes, it needed something. A background. 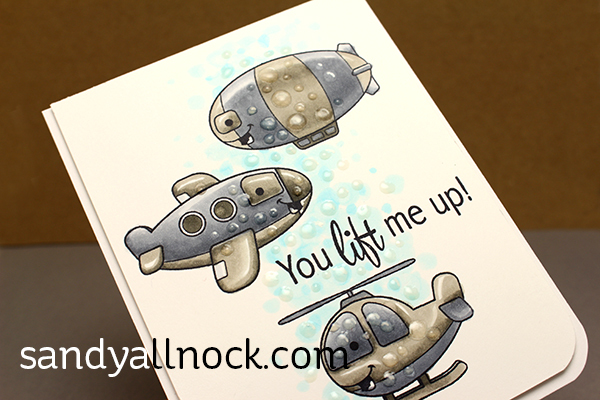 So I started with bubbles, thinking that went with the “lift” in the sentiment. Then….bubbles on TOP of the images? Oh yeah. Chance of a train wreck, but I think it worked! Watch the video below, or click HERE to watch in HD on YouTube. For the card, I just popped the panel on a card base. Rounded the corners…..couldn’t be easier! These are really cute stamps and I love your card idea. The simple color scheme is lovely and doesn’t detract from the card. And of course you can have bubbles in the sky, call it poetic license:) Thanks for the video and for including the Copic colors as you use them, it really helps to see the number and the effect of the color at the same time. I have a small, but really nice collection of YNS. This set may soon join my others. Thanks for showing us a unique twist! Your work, your vision, you are truly awesome. I absolutely love, love your work!!! The ideas you have are just amazing! I look for a new video everyday! I am hooked! Keep it up! Thanks for sharing! Fabulous card!! Your technique looks awesome! I never would have thought to try that! Your talent is unsurpassable. Love this card and the technique and coloring. Thanks for sharing. That is no train wreck and I can’t imagine you ever having any wrecks. Wonderful card. What an amazing bubble effect!